Here north of Boston, we have had a run of cold spring days, with temperatures in the forties and cold rain. But today I found myself admiring a tree leafing out, just outside my office window. I decided to take some pictures. Tonight I cropped this image out of the best of the photos I took today. Here is a recent project that I have been working on. The image began with a snapshot of my mother that I found in her photo album. She is standing in front of the lilac bush and the house where I grew up. This is one of my favorite pictures of her. The original photo was a black and white snapshot, only 2 inches by 3 inches A few years ago, I used Painter to enlarge it and to create a digitally modified and colorized version, posted here on March 27, 2005. 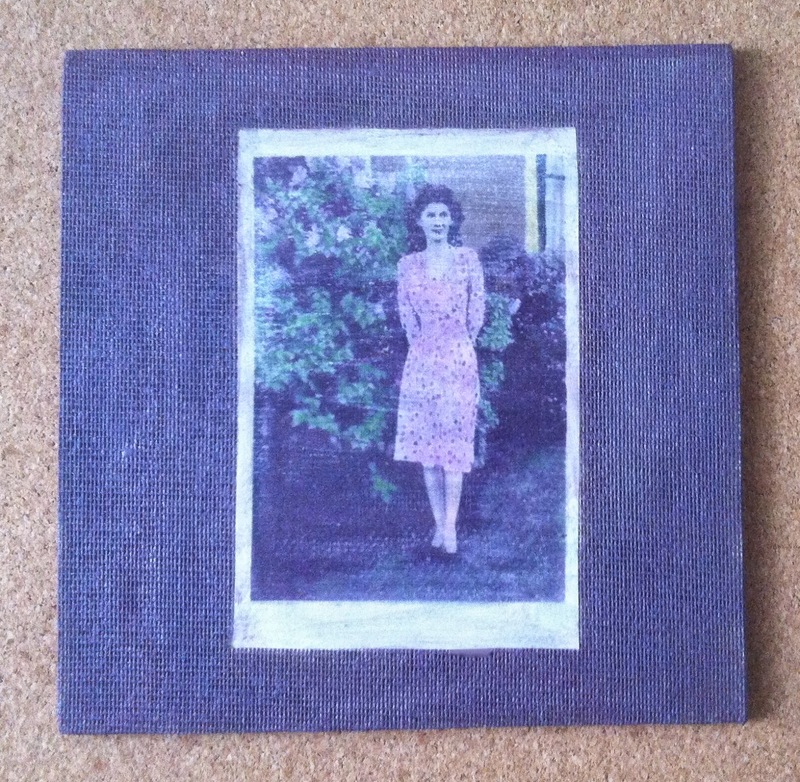 Over the weekend, I made a print of the image and then decoupaged it onto a jute-covered masonite board. 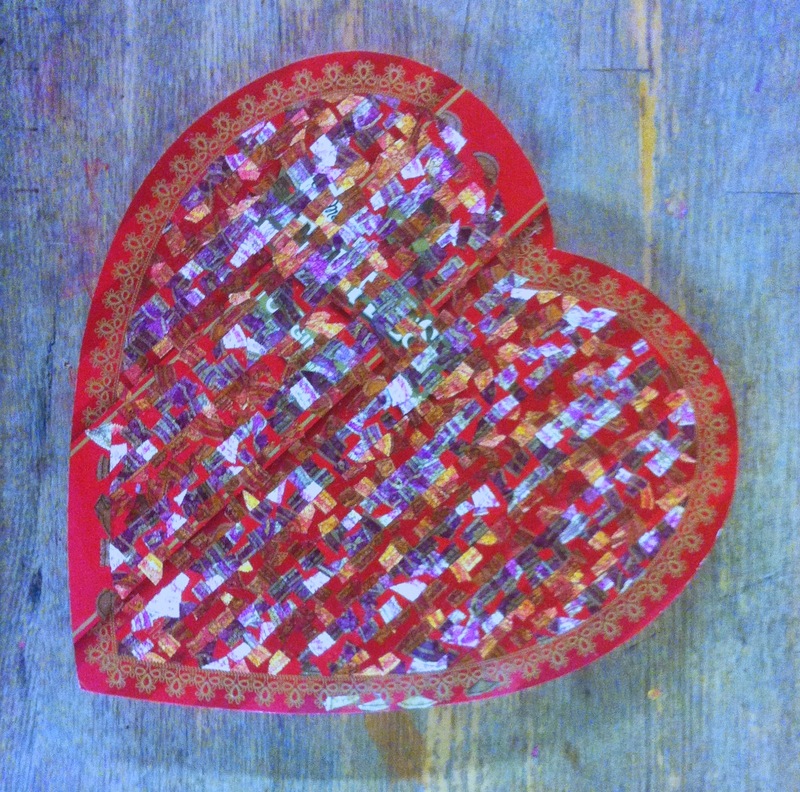 I covered it with gel medium and pressed it down to get the texture of the fabric to show through. Then painted the fabric with a muted lilac color. I wanted something with the faded look of a memory. I thought about adding some kind of ornament (like lace or gold), but that's not who my mother was. She liked things to be modern, plain, straightforward. So at least for the moment, I am leaving this as it is. Here's another pair of earrings that I made some time ago. Recently I came across them while organizing my studio. I decided to photograph them and post them here. 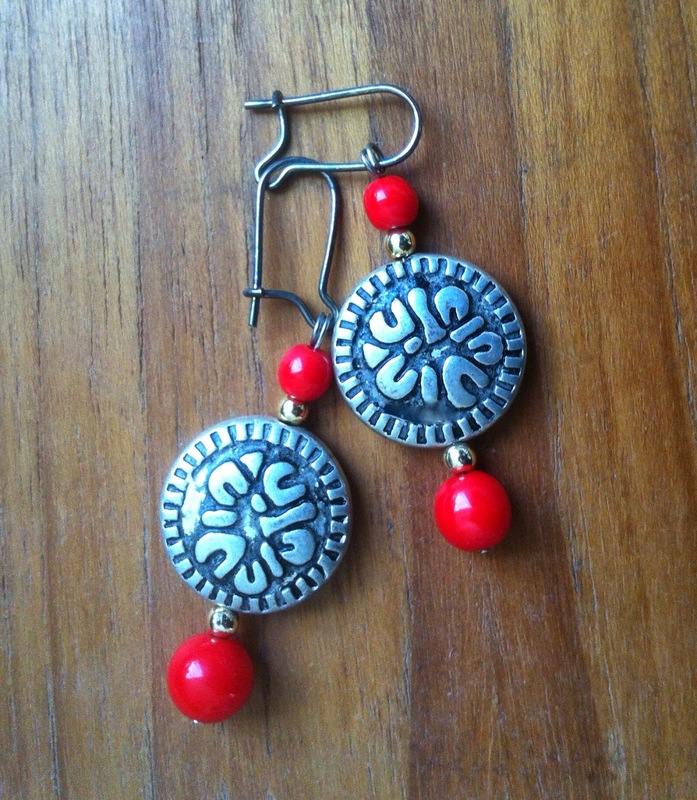 A few days ago, I came across two pairs of earrings that I made several years ago. I decided to take them up to the studio. But first, I took pictures. This is the first pair. Here's one more necklace that I made yesterday. I had fun playing with geometric shapes and for this one. I started with the square beads, which were drilled with extremely small holes. But I was able to use them because I had my new .7 mm stretchy cord handy. Then I added the larger pale spheres, and worked the design from there. Apart from the gold metallic beads that I used for accents, all the beads are made of wood. 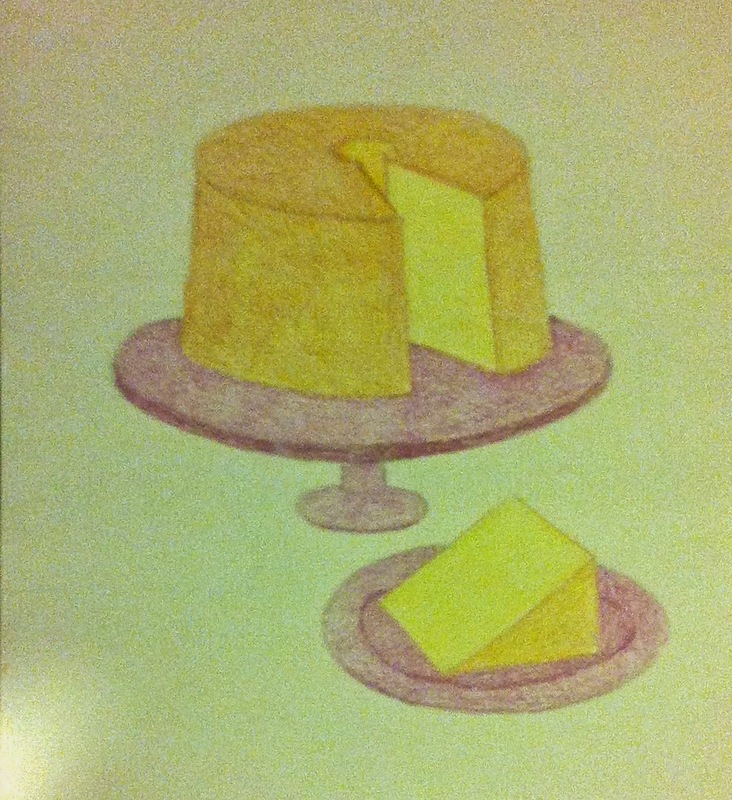 It was also interesting to play with the variations in color as well as shape. The art fair at Porter Mill is Sunday, so I am still making jewelry. 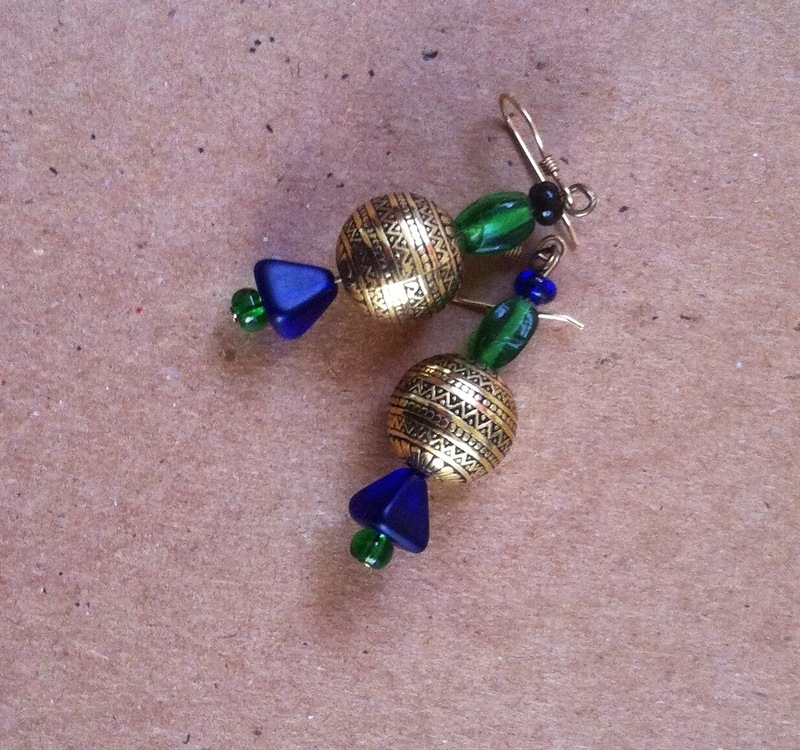 Today I started with these earrings. 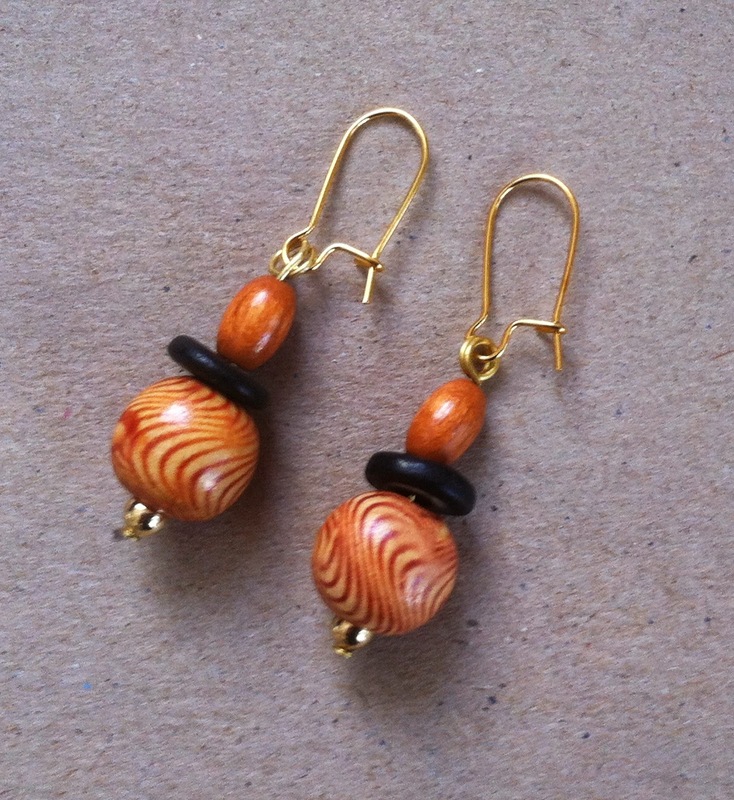 I began with these patterned wooden spheres and decided to make earrings because I only had two of them left They were part of a group of beads that I bought a few years ago in Lake Placid, during a weekend trip. I have been making a lot of necklaces this week, getting ready for the art fair at Porter Mill on April 27, coming right up!. I made this necklace this morning. The green beads seem to be made from reeds or some other natural material. I combined them with turquoise blue hematite disks, then added wooden beads and copper-colored spacer beads. This necklace is strung on new stretchy cord in .5 mm (just purchased last night). I am very excited about this smaller stretchy cord because it can be used on beads with small holes, including semi-precious stone, so this opens up a lot of possibilities for more necklaces. I started this necklace yesterday, but didn't have time to finish it. So I worked on it this morning and finished it with some little gold metallic beads. There is no clasp because the beads are strung on a stretchy cord. 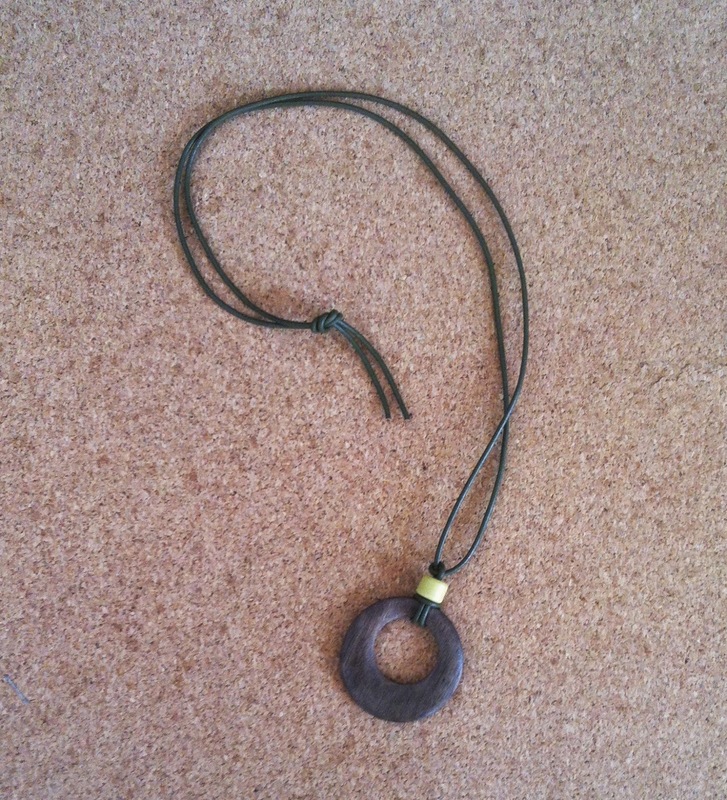 On Sunday, I made this simple pendant, with a wooden circle and one yellow bead on a green leather cord. I have been making necklaces all week, getting ready for an upcoming art fair. Here is the necklace that I made on Saturday. 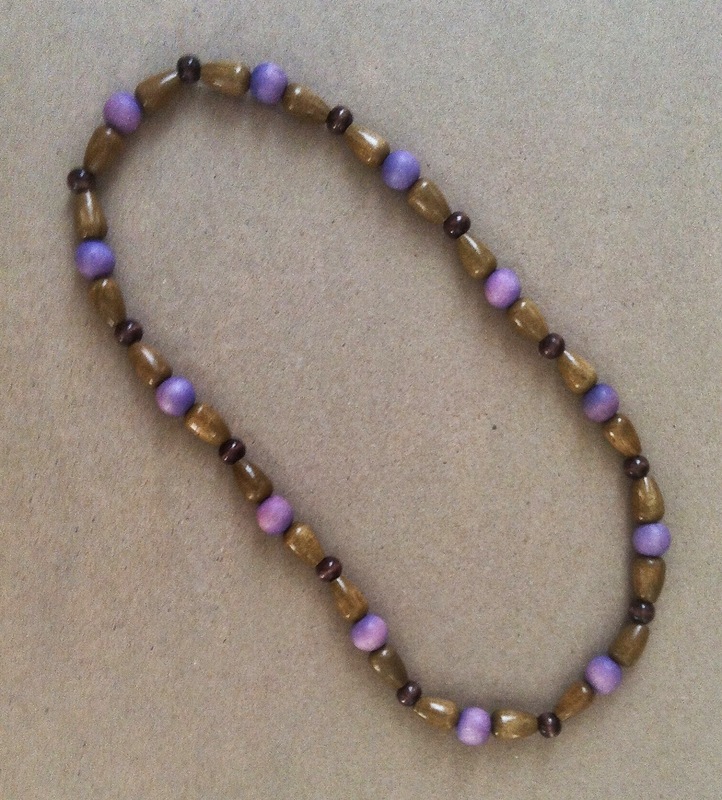 I combined olive green and dark brown wooden beads with some wooden beads that have been dyed a pale purple. I used stretchy cord again, so there is no clasp. 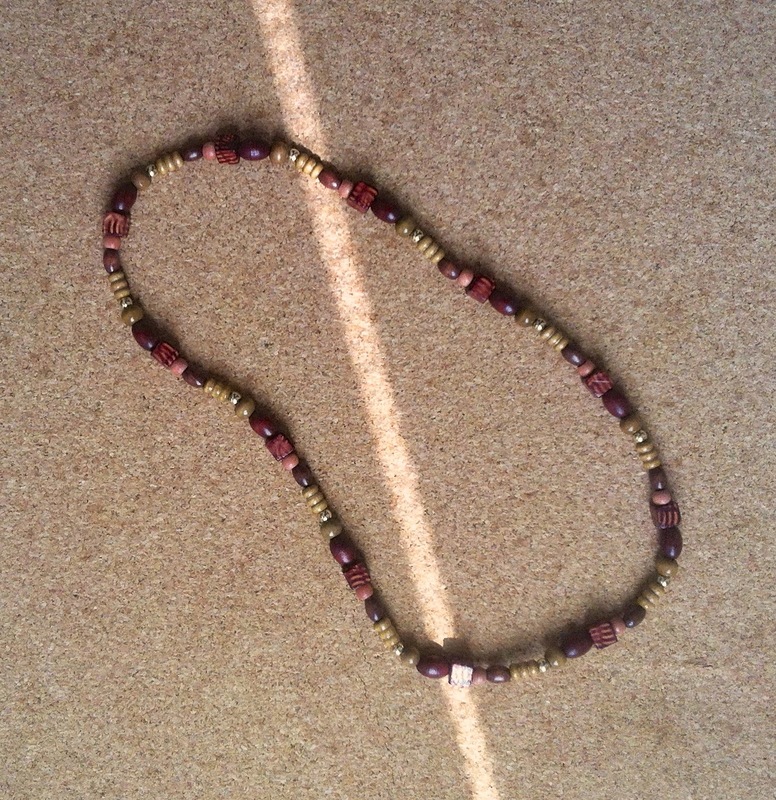 The necklace is finished with a knot, glued and tucked into one of the beads. This is a closeup of the necklace that I made yesterday. In addition to posting this closeup, I just replaced the photo I used in yesterday's post. You can see the new photo here: https://www.flickr.com/photos/randiart/13930294763/ . I am really happy with this necklace, and so I thought it deserved a better photo. Here is a necklace I made today. 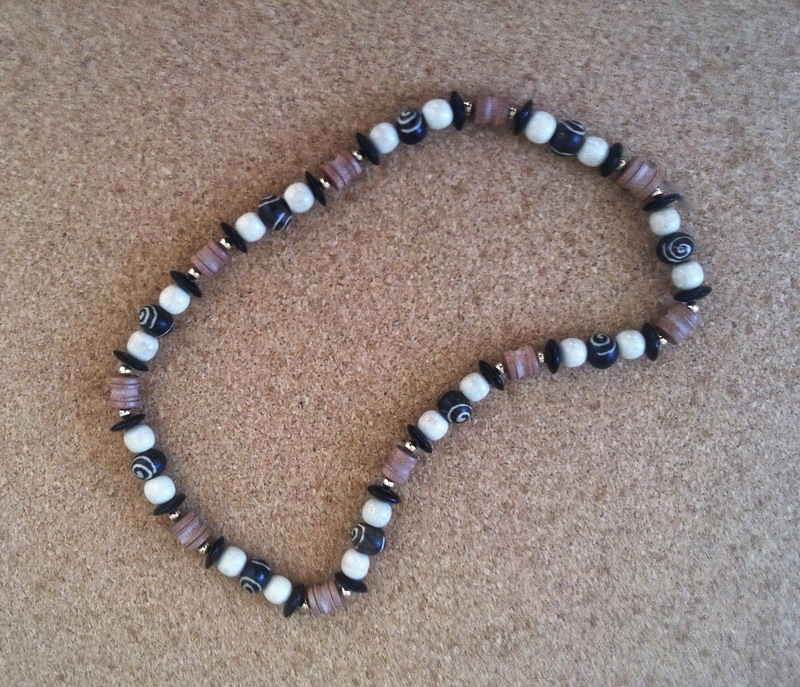 I started with some beads that I bought recently, chocolate brown decorated with a cream-colored swirl pattern. 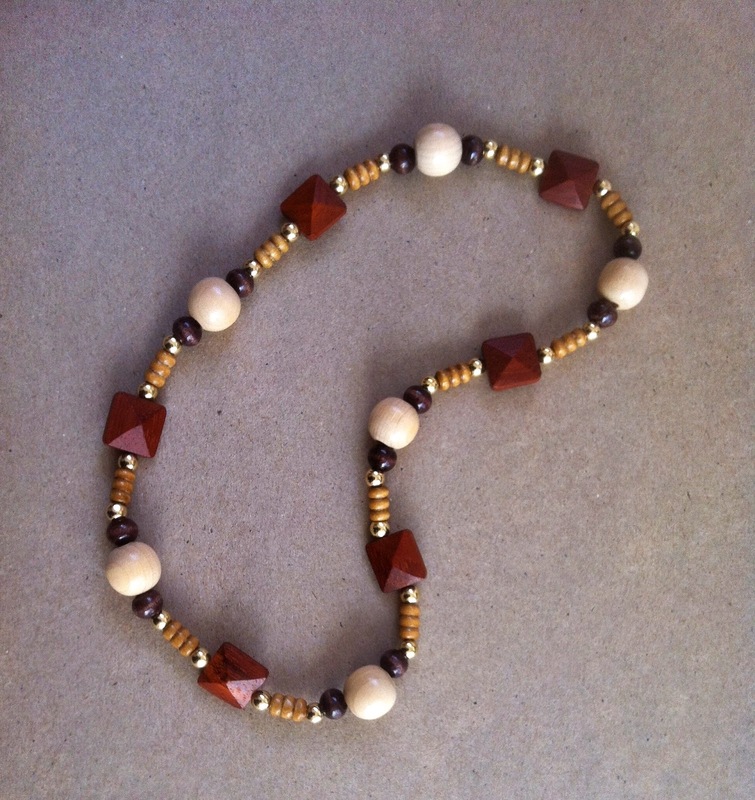 Then I played around with the design, adding wooden beads in other shapes and shades until I came up with a design that I liked. I also used some gold metallic beads as accents. I used a stretchy acrylic cord, so I finished the necklace with just a knot (tucked inside one of the beads), rather than a clasp. Another day, another necklace. 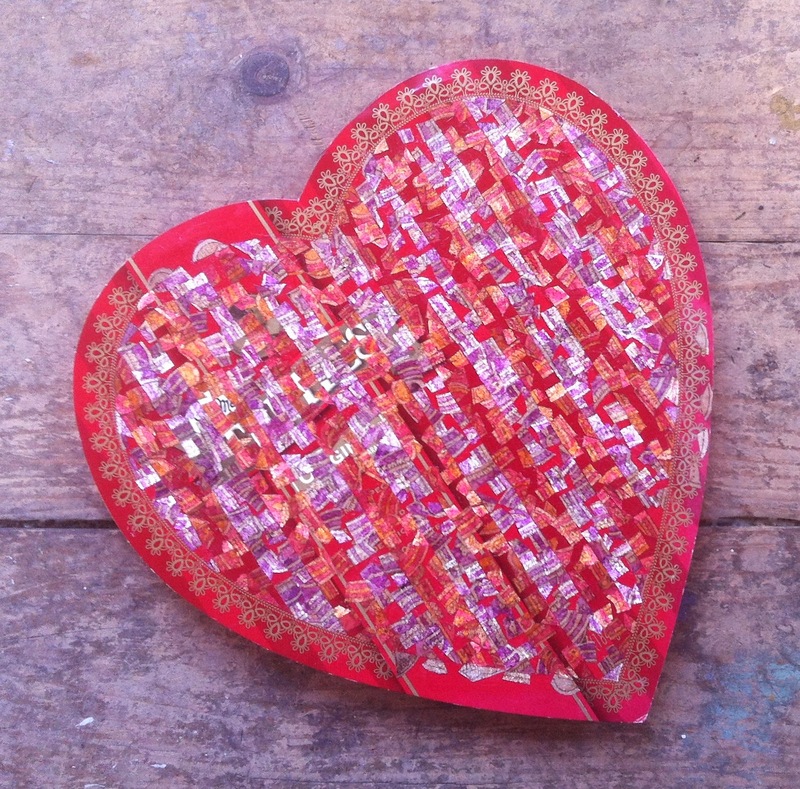 (The first ever art fair at Porter Mill is coming up in ten days, so I am making some new jewelry to show.) 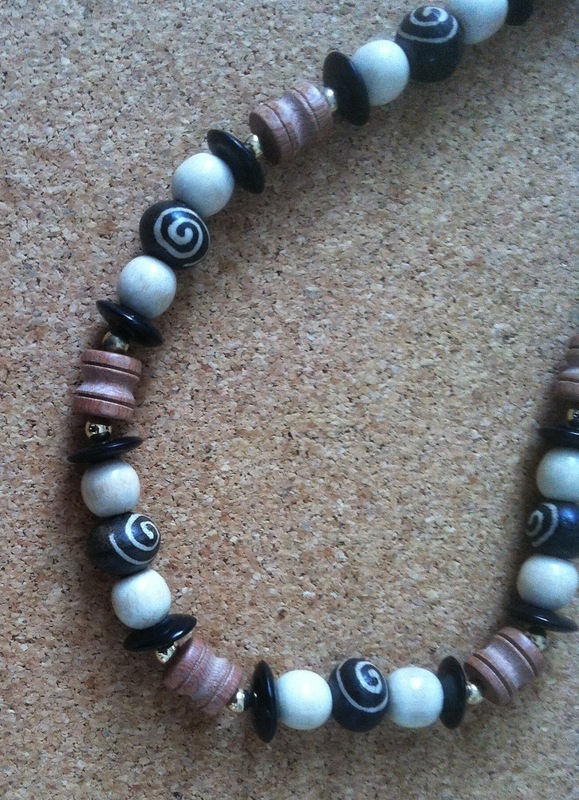 For this one, I started with some incised wooden beads, and then added more wooden beads in different shapes and colors. Then I added gold metallic beads and red-orange glass. I used a stretchy cord, so there is no need for a clasp. 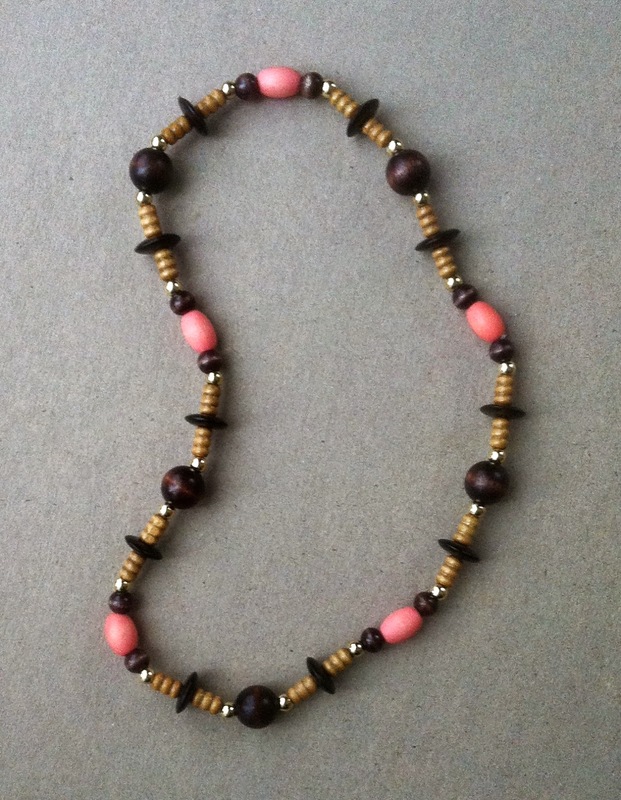 I made another necklace this morning, with wooden beads and gold metallic beads used as accents. This one was easy to put together because I used a stretchy cord (so no clasp), but it took me several attempts to get the design right. I hesitated to use the gold beads, but when I strung them into the design, something clicked. 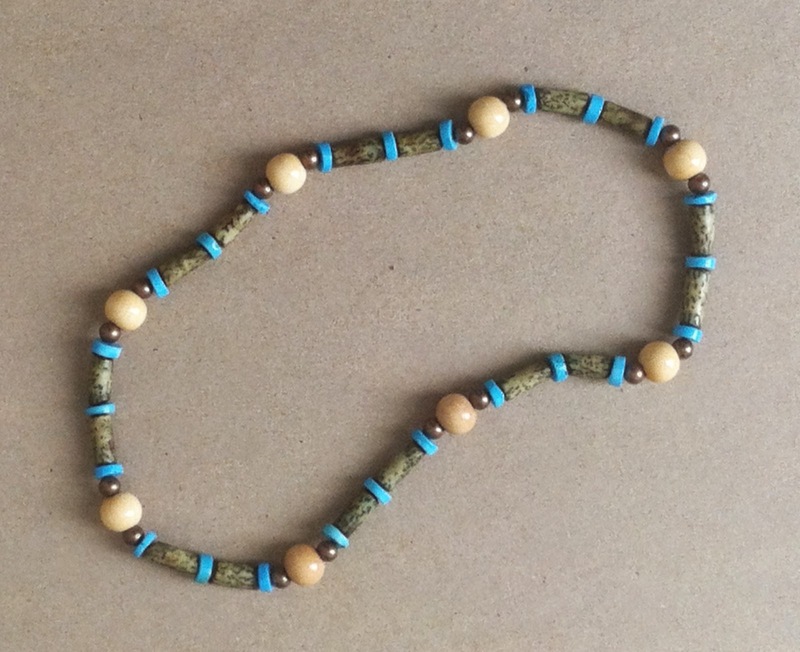 This is the necklace I made this morning, wooden beads on knotted turquoise suede. The design is simple, but tying those knots is never simple. But I am also going to use this image to send holiday wishes to family and friends. I started the day by working on this project, an oil bar painting of a grape arbor, based on a photo that I took at Long Hill Gardens here in Beverly, MA. (My reference photo is posted here on Mar. 20.) Today I worked on the structure of the grape arbor. I actually reworked it several times, and the perspective kept getting away from me. Finally, I turned both the painting and my reference photo upside-down and that allowed me to fix the problem. I am ready to call this one finished and have started sealing the edges of the canvas, even though I may find little errors to correct. One more day working on this painting. I am using oil bars to paint this grape arbor; my reference is a photo that I took at Long Hill Gardens, here in Beverly, MA (posted here on Mar. 20). Today I began by adding suggestions of leaf veins in a few places. I repainted some of the branches, and fixed any problems that I saw in the grapes. At this point, the painting is very nearly done. Tomorrow I plan to fix a few details in the structure of the grape arbor, and then I will start sealing the canvas (painting the edges). This morning, I worked for a while on my grape arbor painting. I am using one of my photos as a reference, a picture of the grape arbor at Long Hill Gardens, here in Beverly, MA. (The reference photo is posted here Mar. 20.) Today I began by repainting the pale blue sky, shoot for clear and uniform color. I think that brightened up the canvas and also made the composition easier to read. While I was at it, I made corrections in the leaves. I also worked on the grape arbor structure. There are a few details left to go, but this painting is almost finished. I started the day by working on this painting. I am working from a photo that I took at Long Hill Gardens in Beverly, MA. If you want to see my reference photo, it is posted here on Mar. 20. I began working with the idea of adding some variation to the colors of the grape leaves, working from my reference photo. As I worked, I made corrections. When I had finished, I took a photograph. However, when I saw the photo, I decided that the color variations were too much, and were making it harder to see the composition. So I went back to work and repainted the greens, toning the variation done just a bit. This morning I continued working on this oil bar painting, based on a photo that I took at Long Hill Gardens, here in Beverly, MA. (The reference photo is posted here on Mar. 20.) I am trying to move this painting towards the finish line. I still want to add some variation to the colors of the leaves, but I decided to do some general cleanup first. Today I concentrated on the light blue areas (sky), sharpening the lines and fixing mistakes along the way. Then I went back and did a bit of work with dark blue, fixing the shapes of some of the grapes. To be continued. This morning I spent some time working on this painting. My reference is a photo that I took at Long Hill Gardens here in Beverly, MA; it is posted here Mar. 20. Today I concentrated on leaves and stems, adding some variation in color, doing cleanup and sharpening lines, and correcting errors along the way. I also scumbled some pale green over the grape arbor structure, giving it a green cast. Here is the oil bar painting I have been working on, based on a picture that I took of the grape arbor at Long Hill Gardens, here in Beverly, MA. (My reference photo is posted here on Mar. 20.) This morning I used the time I had to concentrate on the green stems, trying to figure out where they are going. I started by figuring out where the highlights should go. As I worked, I made small corrections, trying to make sure all the grapes are where they should be. I worked on this painting again this morning. My reference is a photo that I took at Long Hill Gardens here in Beverly, MA. (I posted the photo here on Mar. 20.) I have working on the perspective for the grape arbor's structure. Today I began by turning both the painting and my reference photo upside-down, and re-establishing the lines. I think that was helpful. Then I brightened up the green leaves. And finally, I mixed some dark red with the blue I am using, to get the darkest value for the grapes. Then I used it to try to show relative positions in space, and I think it helped. 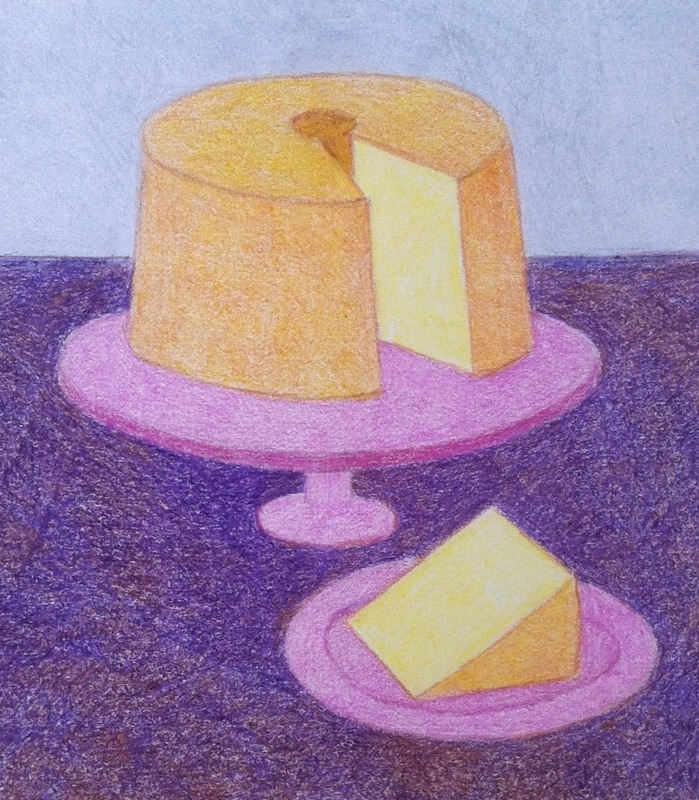 My folks were married on April 4, 1943, and I usually create an image to celebrate the date. My dad was born in Brooklyn, NY, but met my mother in Pueblo, Colorado where he was stationed during WW II before going off to Europe . My parents met at a USO dance and married just a few weeks later, and took a brief honeymoon to New York just before he went overseas for two years. While he was away, my mother kept an album that began with their first date, their wedding, and honeymoon, and then pictures he sent her back from Europe as well as pictures of her doings back home in Pueblo. This morning I chose this snapshot, part of the honeymoon series in my mom's album. I don't know who took the picture, but it was probably one of my father's sisters.I scanned the snapshot into the computer, and used Painter software to add color with color overlays and digital pastel, and tried to get a little distance with a digital woodcut effect. It was fun working on this today. My mother labeled each picture (with ink on black paper) and she called this one "Mr. and Mrs. Hy." This morning, I worked on this painting of a grape arbor. My reference photo (posted here Mar. 20) is a picture that I took at Long Hill Gardens here in Beverly, MA. Once again I was short on time, so I concentrated on adding highlights and shadows to the grapes, trying to delineate shapes and relative positions. I didn't get a chance to paint today, but here is a closeup of the painting I have been working on. This is an oil bar painting based on a photo that I took at Long Hill Gardens here in Beverly MA. (My reference photo is posted here on Mar. 20, 2014.) Sometimes it is helpful to take a closer look. And it is encouraging to see that at least some of the grapes are behaving.